This was a tough week. Not for staying on track - in fact I was really great this week. Unfortunately we had an unwanted house guest; the flu! Yesterday I hardly ate at all. Partly because I didn't have much of an appetite and partly because I was incredibly busy taking care of 3 sick kids, 1 of whom was VERY ill (you can read about it here). You might notice something new in my weigh in photo... Yes, it's a new scale! The last couple weeks I've noticed some major inconsistencies with my "old" scale (which is actually less than a year old). If I didn't weigh in the exact same spot every time - then I would have huge discrepancies with my weight (as much as 4 pounds heavier than I am). I used to weigh myself in the garage - but decided I would start weighing myself in the kitchen. Even then, I still found the inaccuracies if I weighed myself in a different spot only inches away. I decided to order a new scale (I had won a $25 Amazon gift card in a blog giveaway, figured I would just apply that to the purchase). I feel a little silly now, because I've noticed discrepancies with the new scale too - but not nearly as drastic (at most, a 1 pound difference). I'm going to go ahead and stick with the new scale, despite the fact that I weigh more than a half pound heavier on the new scale (thus resulting in a disappointing weigh in this week). The positive side is I have a loss, albeit a minuscule one. This is a fine example on why I don't wish to be a slave to the scale... I know I did extremely well this week. I ate VERY healthy, never exceeded my points, and earned nearly a day's worth of activity points from exercising this week. I should have seen a greater loss, but I didn't. 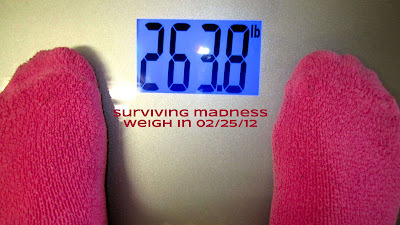 Another point I'd like to make before I finish - I have always weighed heavier than I look. It might not show now because I'm so morbidly obese - but when I get down under 200 pounds - it will be more noticeable. The lady from RunsforCookies.com weighed about 20+ pounds less than my starting weight - but she wore bigger sized clothes than I wear (she wore 2x/3x and size 24 pants - while I wear size 1x/2x and size 20/22 pants). The numbers on the scale are only a relative indicator and certainly not the only indicators! If you lost even a tiny bit on a new scale, that's a victory. Great job! Thank you Rachel! If I went by the old scale I lost about half a pound - but decided to stick with the new scale from here on out. I noticed a big difference this time around though - because when this happened in years past - I would get all depressed, discouraged, frustrated, and ultimately give up and stuff my face full of whatever I could find! This time, however, I'm going to keep on truckin' - it truly didn't bother me because I know I'm doing what's right! :D Thanks for all your support - it really makes a BIG difference!